People have always tended to look down their nose at the Three Stooges. Larry, Curly and Moe were never exactly subtle and their comedy was pure slapstick which revolved around poking each other in the eye and handing out a good slap in the face. I’ve always had a soft spot for them, mainly because of an afternoon spent in a cartoon cinema in London with my mate Dancin’ Jones and a fellow film student called Scouse Annie. After spending lunchtime in a pub downing a few pints of Fuller’s London Pride we were up for a good time and found it in the rolling programme of cartoons and short films. As always, we found the RoadRunner particularly funny but were in hysterics when the Three Stooges flickered onscreen in a grainy old black and white movie called ‘Fifi Blows Her Top’. I can’t remember a thing about the film except laughing until the tears rolled down my face. All of this was brought to mind when reading Denis Norden’s book ‘Clips from a Life’ in which he recalls that at an American auction in November 1993 a signed group photo of Larry, Curly and Moe went for $1,820 while a signed group photo of Presidents Nixon, Ford and Carter fetched $275. Quite right too. 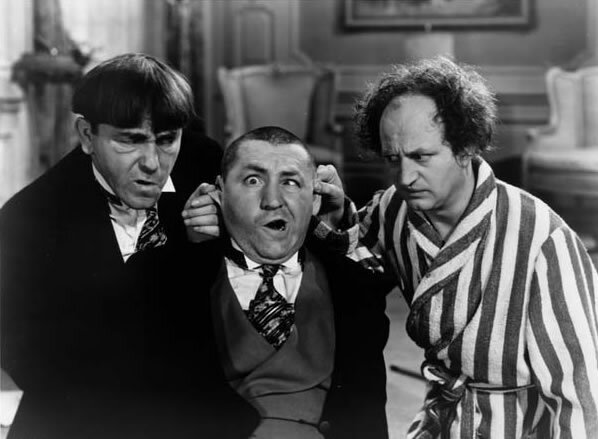 The Stooges churned out 200 films - 190 of them shorts - during their prolific career and probably brought more fun and laughter into the world than any President.